Chishu Ryu said “Ozu-san didn’t make any heroic movie during the war”. This is true. He did not make any combat films, heroic military action films nor pseudo-historical drama to support totalitarian political agenda. But it does not mean he was making films in vacuum. “I was born, but … (1932)” may seem the last place for anyone to find any war propaganda, but, remember, it was filmed in 1932, the year of Shanghai Incident. During the scene in the classroom, you can see a rather large frame of Japanese calligraphy on the wall. It says “Bakudan Sanyu-shi”, or “Three Human Bombs“. “Human Bombs” ? Yes, this is the most heroic tale of three Japanese soldiers during 30’s. It happened on February 22, 1932 near Shanghai. Three soldiers, with the bombs strapped to their bodies, dashed into the enemy line, sacrificed themselves so that troops could charge into the enemy stronghold. They called these three brave soldiers “Bakudan Sanyushi” or “Three Human Bombs”. This story fascinated Japanese media and entertainment industry at the time, and fierce media circus ensued. Many studios produced extremely raw quickies about the incident (like “Churetsu nikudan sanyushi [release date: 3/6/1932, Tokatsu Eiga-sha]”, “Nikudan Sanyushi [release date: 3/3/1932, Shinko Kinema, the print survives in MOMAT archive]”, “Nikudan Sanyushi [release date: unknown, Akazawa Eiga]”, “Nikudan Sanyushi [release date: 3/17/1932, Fukui Eiga]”) within a few weeks. Japanese public loved them and craved for more. Newspapers ran special reports on the soldier’s families and the songs about three heroes were recorded. So this frame of Japanese Calligraphy about the patriotic soldiers is not out of the place in this particular time in history. The film was released on June 3, 1932. It was less than four months after the incident. You don’t need a long time duration to cook up a war hero. The most disturbing thing is, the story was largely a fabrication. Three soldiers died, but not so heroically. It was a tragic accident. But Japanese wartime government, with help of entertainment industries, effectively exploited the whole thing to manipulate public psyche. And as you can guess easily, the story became the forerunner of Kamikaze. 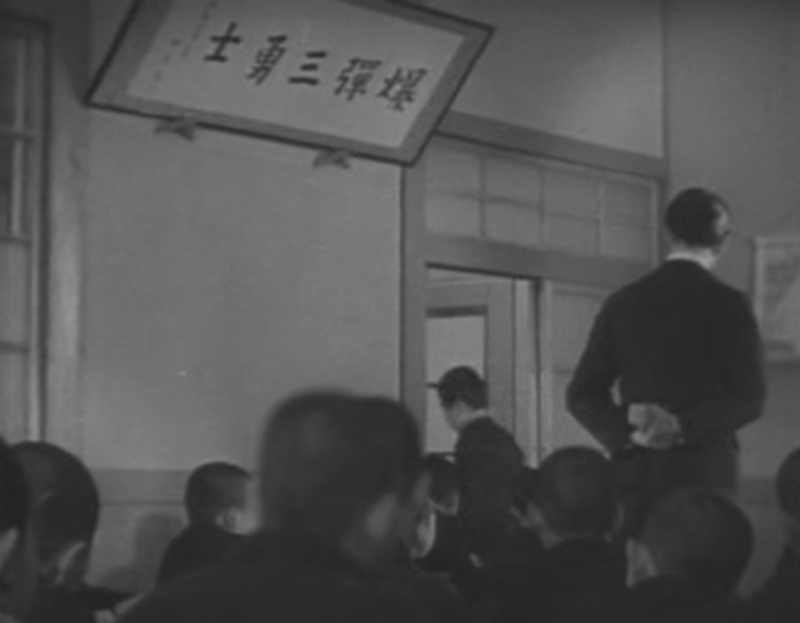 I do not think Ozu put that calligraphy frame up there as a war propaganda. But it shows the background of the film, the mood of the time. And these kids in the classroom were probably seven or eight years old at the time. They would have become 19 or 20 years old in 1944, the year Japanese military organized the Kamikaze unit. Kamikaze pilots mostly were between 17 and 24 years old. Soldiers died in Saipan, Guam, Imphal and other battles were also in that age group. Then, this calligraphy frame quietly looking down on all these adorable kids makes us realize the insidious nature of human violence.